In some ways, life in the Amazon rainforest continues just as it did a millennia ago. Both light and time seem unable to penetrate the near hermetic canopy of towering trees sewn together with vines and moss. From ancient bird-eating spiders to endemic monkeys that can sit on your fingertip, to thousand year old indigenous tribes still hunting with blowguns and spears, the Amazon is a virtual time machine whose every inch is energized with life. Though tropical rainforests cover less than 10% of the Earth's surface, they account for over 50% of its species. One hectare of forest in the Ecuadorian amazon boasts about as many frog species as all of North America, and just one Amazonian tree can host more ant species than all of the British Isles combined. 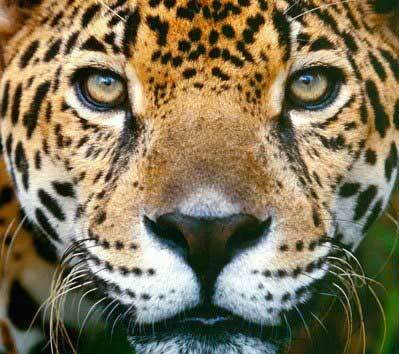 The Amazon Rainforest enthralls any person that has the good fortune of experiencing it's wonders. Let it captivate you too! There is no better complement to you trip to the Galapagos Islands like a visit to the Ecuadorian Amazon Rainforest. 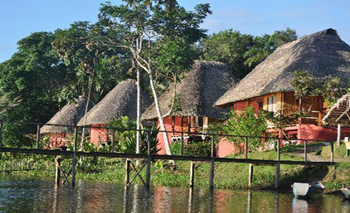 We offer a variety of lodges that provide top-notch service and are an excellent introduction to the Amazon Rainforest. 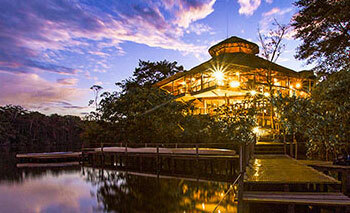 The Napo Wildlife Center is the most luxurious lodge in the Ecuadorian Amazon. 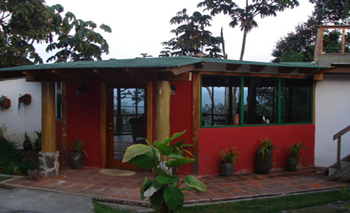 The lodge consists of 16 cabañas and a large dining hall with a library and a well-stocked bar. Attached to the bar is a 50-foot viewing tower from which you can see the Andes on a clear day! To get to the Napo Wildlife Center, guests fly by jet from Quito to the town of Coca on the Napo River. From Coca you will take a motorized, covered canoe for a scenic two-hour trip down the Napo River. Upon arriving at the entrance to the NWC Reserve, we switch to small, dugout canoes and continue paddling up the black water creek to the lake and lodge. The Hamadryade Lodge is located right in the rainforest and offers a unique chance to fully appreciate the Amazonian experience. Every night the tranquil sounds of the jungle will guarantee you have a relaxing night’s sleep. Each suite-bungalow is a tribute to the mysterious cultures of various Amazonian ethnic groups providing a fusion of traditional and modern design. 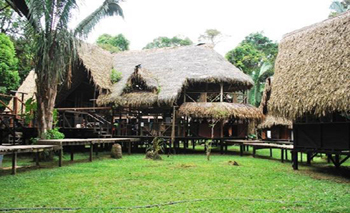 La Casa del Suizo is located on the banks of the Napo River next to an indigenous community. It is surrounded by beautiful Amazonian landscapes. 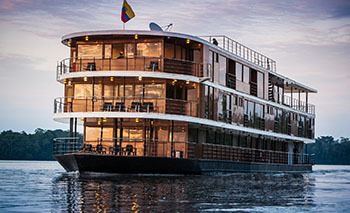 Experience the unmatched biodiversity of the Amazon Rainforest with our Manatee Amazon Explorer Cruise. The rainforest is home to a diversity of flora and fauna species unknown in any other part of the world. Howler monkeys perch high in the tree tops feeding on a rich diet of insects only found in the Amazon. Birds of unimaginable color and diversity fill the rainforest canopy including macaws, parrots, hawks and the great harpy eagles. The magnificent rivers of this region are the lifeblood of these birds. The rivers are also home to caimans, fresh water river dolphins, piranhas, catfish and giant paiches. Butterflies of exquisite color, beauty and unusual size are common here as well as the croaking of giant frogs. Things you had only imagined before become a reality in the Amazon Jungle. The lodge is found within a 5000-acre private ecological reserve in Ecuador's Amazon region, an accessible yet pristine rainforest sanctuary where you and your family may enjoy a true jungle adventure in safety and comfort. The lodging at Sacha was carefully designed to offer comfort to the traveler yet preserve the environment and rainforest ambience. Guests may also enjoy a raised lookout above the main bar and lounge, which offers a scenic view of Pilchicocha Lake and excellent opportunities to birdwatch. Electricity is not provided at the bungalows, but Cotococha Amazon Lodge has oil lamps along the paths and at the bungalows, which illuminates the property creating a very romantic atmosphere. Cotococha Lodge has a cozy lounge with a fireplace which offers comfortable seats to read or share your Amazon tour experiences with other travelers. A recent addition to the social areas is a second floor reading area. In the evenings and mornings you can enjoy breathtaking views of sunsets and sunrises which color the skies, waters and the Amazon rainforest. At only 10 km from Tena, capital of the absolutely safe Napo Province, this private hacienda of approximately 150 ha is the perfect place to enjoy to the fullest a never-ending series of activities, which this area lends itself to more than any other. 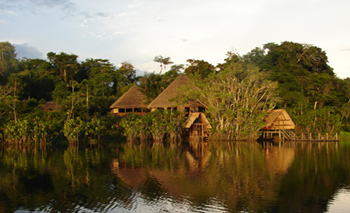 The Jamu Lodge is located on the Cuyabeno River, 15 minutes downstream from the marvelous Laguna Grande. 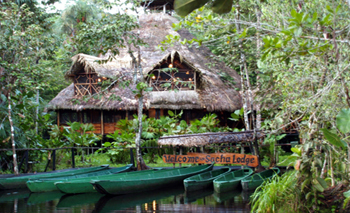 The lodge offers the choice of a number of different programs that enable you to explore the jungle such as canoe rides to the primary forest or around the lake where you can see exotic trees and plants like orchids, bromeliads, and gardenias. Afterwards you can relax while sitting in a hammock or drinking an exotic cocktail at the bar. 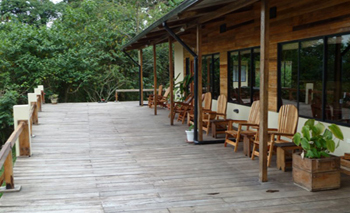 Nicky Amazon Lodge has – without doubt – the best location of all the lodges in the Cuyabeno National Park. It is situated exactly on the lower part of the Aguarico River. Because of it’s unique location that is further away from the National Park Entrance, it is less likely to run into other Amazon tourists during the excursions. A quiet and peaceful environment is crucial for spotting of all kinds of wildlife. San Isidro Lodge is surrounded by its own 1,300 forest reserve and has built up a reputation for being the pioneer in private conservation and birding/nature tourism on the northeast slope of the Ecuadorian Andes. Just outside your cabin is a mirador lounge where groups can tally bird lists or just sit back and enjoy the breathtaking view of the surrounding hills after a long hike. In the cozy living room of the main house, you can enjoy a local welcome cocktail that is sure to warm you up. Sani Lodge is truly a one of a kind Ecuadorian ecolodge dedicated to ecotourism, environmental conservation, and community projects in the Amazon rainforest of Ecuador. 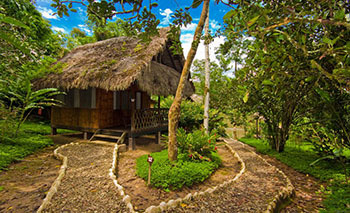 Sani Lodge is owned and operated by members of the Sani community meaning that with their extensive knowledge of the Amazon wildlife and biodiversity, they can give Sani Lodge guests the true experience of the Ecuadorian Amazon jungle. In addition to providing excellent service to its guests, Sani Lodge participates in community ecotourism - profits from the jungle lodge are reinvested into the community improving the lifes of all who live there. Wild Sumaco Lodge is the perfect destination for anyone seeking great bird watching opportunities and the tranquility of the rainforest in Ecuador's eastern foothills. It has panoramic views reaching across the Rio Pucuno Valley and to the Andes beyond. On clear days the distant snow-covered heights of El Altar, Tungurahua, and Antisana volcanoes glow white against the blue sky. North of the lodge is Sumaco National Park, and often the volcano Sumaco can be seen peeking through the clouds and mist surrounding its heights. 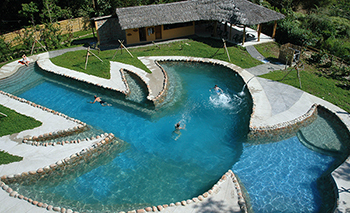 The Amazon Dolphin Lodge is located in the Pañacocha protected forest reserve and is central to a biological corridor linking Yasuní National Park and the Cuyabeno Wildlife Refuge. The lodge got its name from the Amazon river dolphin which can be seen swimming each day. Visitors can enjoy swimming in the lagoon as well as the magic of bird watching as they float along the edges in dugout canoes. The Cuyabeno Lodge is the oldest lodge in the Cuayabeno Reserve, and is located on the most beautiful location on the bank of the Great Cuyabeno Lake. Guango Lodge is a new, small tourist facility on another family property that is surrounded by temperate forest and very birdy flocks. 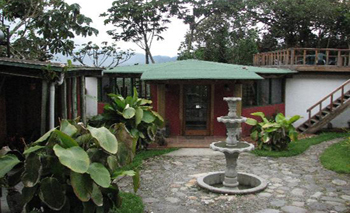 Guango Lodge, about 1 hour away from San Isidro, lies at a higher elevation (about 2,700 meters) on Ecuador's eastern slope, only 11 kms down the main Interoceanica Highway from the town of Papallacta. This area is centered in a zone classified as humid temperate forest, a habitat distinctly different from San Isidro and characterized by its more stunted trees (and thicker canopy), cooler climate, and different bird and plant composition. 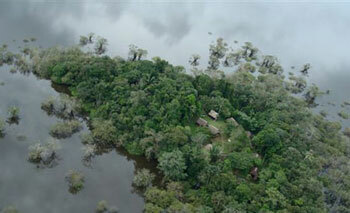 Located in the upper Ecuadorian Amazon region, the Tapir Lodge is within the Cuyabeno Wildlife Reserve. Building the Tapir Lodge was made possible through a network of partnerships with Siona Community family members and private sponsors. 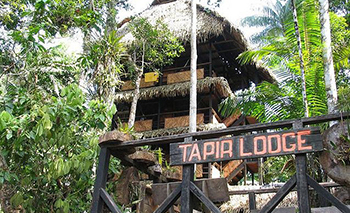 In order to meet highest ecological standards, Tapir Lodge shares access to and profits from the ecotourism activities with the Siona Community. The heart of the jungle is a delicate and unique place. 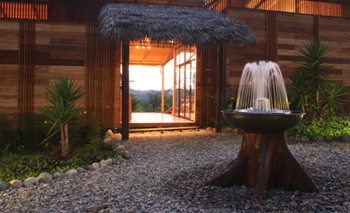 The Tapir Lodge was built with this in mind and offers facilities that have a minimal impact on the environment. For example, we use solar panels as an alternative means of electricity for illumination. It's safe to assume a few things about a Galapagos visitor. The Galapagos are extremely remote, so it takes a dedicated traveler to get there in the first place. Galapagos is known for wildlife: it's a zoo without walls and many Galapagos visitors are animal lovers. The Galapagos appeal to budget and high-end travelers alike and the Galapagos tourism industry there has a very good reputation. Finally, the Galapagos are not for those who want to relax on a beach: this "off the beaten path" destination is rugged and challenging. So if you're an adventurous, wildlife-loving traveler who's not afraid to go out of his or her way to see something really special, I've got some good news for you! Ecuador is not only home to the legendary Galapagos Islands, but also the deep green jungle of the Amazon rainforest. A trip extension into the rainforest is easy to arrange and a truly unforgettable complement to your Galapagos journey. The Amazon is the largest tropical rainforest in the world and is home to a significant percentage of the world's wildlife and plant species. The forest teems with life, from the leaf-cutter ants on the ground to the parrots in the air. A single hectare of Amazon rainforest may be home to thousands of different species of plants, hundreds of insects and dozens of reptiles, amphibians and mammals. The Ecuadorian rainforest in particular is noted for birds: of the 9,000 or so birds that are known to science, some 1,500 of them are native to Ecuador. Many of those birds make their home in the rainforest. The rainforest itself is a dense, living jungle. The rivers are fast, the air is humid and the thick green canopy dims the sunlight. The abundance of life makes for intense competition: plants grow on top of one another, clamoring for sunlight. Drop a banana peel on the ground and it will be gone within hours, carried off by ants and beetles for food. The treetops are alive with birds, monkeys and butterflies. Timeless cultures such as the Achuar people still live, hunt and fish the same way they have for millennia. 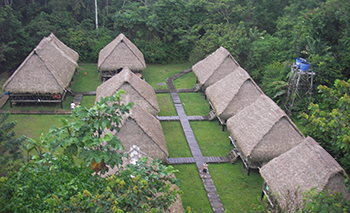 Ecuador's rainforest tourism industry is well developed and known for good service. Most of the animals live deep in the jungle, far from the cities, and therefore most visitors opt for a multi-day stay at one of the many remote rainforest lodges. A minimum stay is three days/two nights, but it's better to stay a little longer and fully take in the jungle. The lodges range from fairly inexpensive thatched-roof cabins to air-conditioned luxury camps with swimming pools and internet access. However many stars your hotel has, a day in the jungle is similar everywhere. The lodges have guides, often natives who speak Spanish and English in addition to the local dialect. The guides lead informative hikes, pointing out medicinal plants, spotting camouflaged animals and treating visitors to special jungle experiences, such as snacking on lemon-flavored ants! Guided boat and canoe rides on the rivers and lakes are also popular: at night you can often see caimans, a relative of the alligator. On guided night hikes, you may see bats, scorpions and other fascinating insects and animals! Many lodges make a point of giving back to the local community, hoping that tourism will replace other less sustainable industries such as hunting animals and birds to sell as pets. 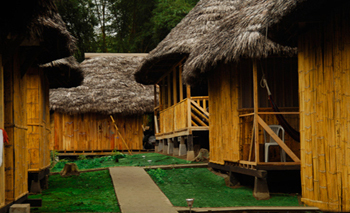 Some of these lodges are all or partly owned by the local community and the profits go to schools and social programs. Most lodges will at the very least offer tours of local communities. Galapagos Travel Center works only with the most reputable lodges in Ecuador. 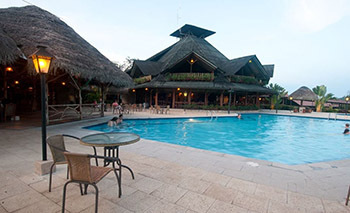 Some of these lodges have decades of experience and have provided unforgettable experiences to thousands of visitors. 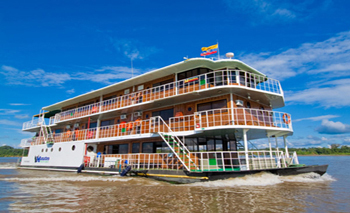 The lodges vary according to price, location and level of comfort: you can even book a trip on a floating hotel which cruises up and down the Napo River (a tributary to the Amazon)! Don't let the adventure end in the Galapagos...see your Galapagos Travel Center representative about an extension into the mighty Amazon!